We have greatly expanded our already extensive range of enclosure gaskets with the addition of many new profiles. A number of these are specialist sections specifically for allied applications such as motor vehicles, railway carriages, and off-road trucks and machines such as agricultural equipment and fire trucks. Coaches and motor homes also feature with moulded sections to suit doors, windows and ventilation panels, as well as external storage compartments. Now with a massive 732 standard sections, we also offer a bespoke custom design service – where there is a requirement for a really different profile then the EMKA engineering design team are delighted to develop and produce to suit specific needs. We have extruded gaskets for enclosures and other purposes available in self-adhesive, self-grip (clip-on), channel fixing and window type (with expansion insert). 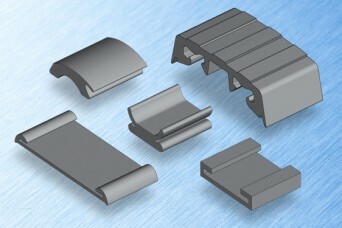 These come in many material types including EPDM, NBR, CR, PVC and silicone, as well as many with EMC compatible coating. Other products in the range feature edge protection or wiping capabilities while the tank band support sections fill a very specific role for trucks and similar vehicles where fuel/water/oil tanks are secured by banding straps. See our main catalogue for general enclosure/cabinet sealing sections, see our road & rail catalogue for automotive/rail and related sections – or contact us for information on custom sections. Share the post "Extruded Gasket Range reaches 732 Sealing Profiles"